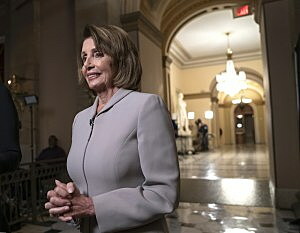 WASHINGTON (CN) – Cleanly squelching an attempted insurrection from some fellow Democrats, Rep. Nancy Pelosi was elected speaker of the House Thursday for the second time in her three-decade career in Congress. Democrats cheered and applauded as it was announced that Pelosi received 220 votes of the votes cast, enough to earn her the speakership. The House convened at noon, jovial and loud, to begin the new Congress where Democrats lead following a power shift in the 2018 midterm elections. Before a morning prayer brought silence to the cacophonous chamber, Democrats applauded the announcement that the previous Congress, which was controlled by Republicans, had ended. Jennifer Hijazi contributed reporting to this article.